Acari in Photographic Baths and Chemical Solutions. A rare original article from the Intellectual Observer, 1862. Intellectual Observer, London, 1862. First Edition, Disbound. Very Good. 2 pages. Note; this is an original article separated from the volume, not a reprint or copy. Size: Octavo (standard book size). Quantity Available: 1. Category: Intellectual Observer; Inventory No: 227202. Aerolites with Low Velocities. A rare original article from the Intellectual Observer, 1864. Intellectual Observer, London, 1864. First Edition, Disbound. Very Good. 2 pages. Note; this is an original article separated from the volume, not a reprint or copy. Size: Octavo (standard book size). Quantity Available: 1. Category: Intellectual Observer; Inventory No: 227449. 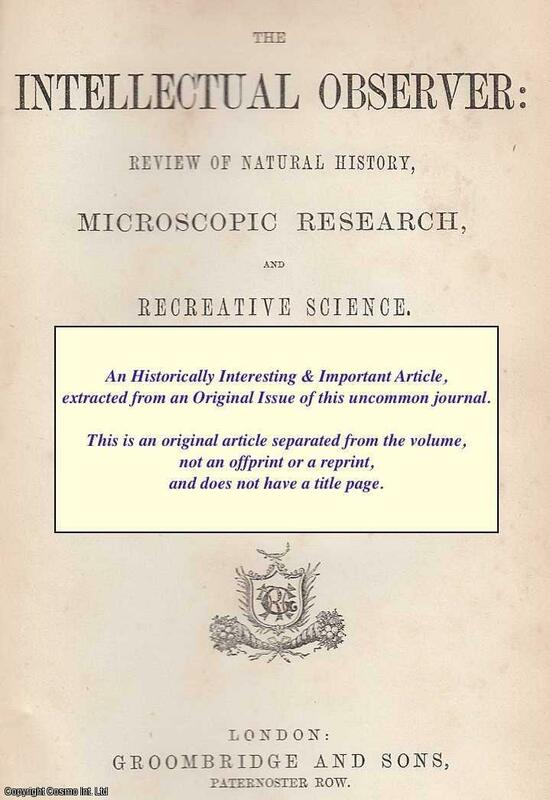 Aids to Microscopic Inquiry: Considerations from Physics. A rare original article from the Intellectual Observer, 1864. Intellectual Observer, London, 1864. First Edition, Disbound. Very Good. 7 pages, some foxing. Note; this is an original article separated from the volume, not a reprint or copy. Size: Octavo (standard book size). Quantity Available: 1. Category: Intellectual Observer; Inventory No: 227504. Aids to Microscopic Inquiry: Heat and Organization. A rare original article from the Intellectual Observer, 1864. Intellectual Observer, London, 1864. First Edition, Disbound. Very Good. 8 pages, some foxing. Note; this is an original article separated from the volume, not a reprint or copy. Size: Octavo (standard book size). Quantity Available: 1. Category: Intellectual Observer; Inventory No: 227518. Aids to Microscopic Inquiry: Notes on Organic Chemistry. A rare original article from the Intellectual Observer, 1864. Intellectual Observer, London, 1864. First Edition, Disbound. Very Good. 9 pages, some foxing. Note; this is an original article separated from the volume, not a reprint or copy. Size: Octavo (standard book size). Quantity Available: 1. Category: Intellectual Observer; Inventory No: 227556. Aids to Microscopic Inquiry: The Illumination of Objects. A rare original article from the Intellectual Observer, 1865. Intellectual Observer, London, 1865. First Edition, Disbound. Very Good. 6 pages. Note; this is an original article separated from the volume, not a reprint or copy. Size: Octavo (standard book size). Quantity Available: 1. Category: Intellectual Observer; Inventory No: 227567. Aids to Microscopic Inquiry: Hairs of Plants. 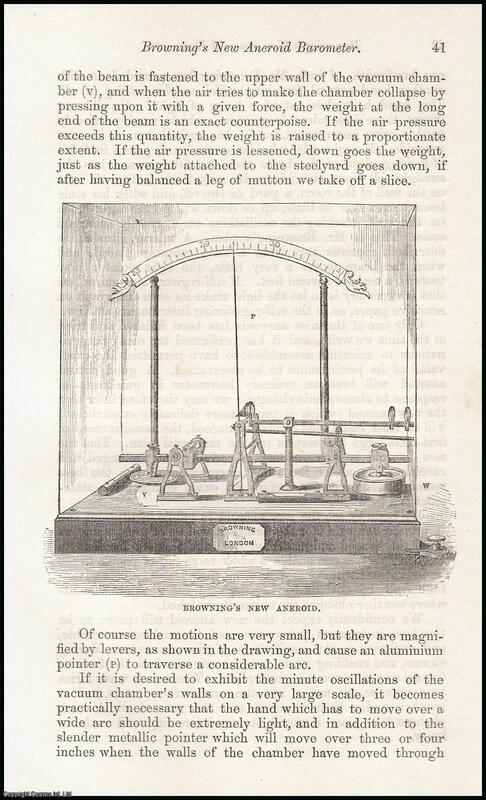 A rare original article from the Intellectual Observer, 1865. Intellectual Observer, London, 1865. First Edition, Disbound. Very Good. 4 pages. Some foxing. Note; this is an original article separated from the volume, not a reprint or copy. Size: Octavo (standard book size). Quantity Available: 1. Category: Intellectual Observer; Inventory No: 227572. Analysis of Mixed Fabrics. A rare original article from the Intellectual Observer, 1863. Intellectual Observer, London, 1863. First Edition, Disbound. Very Good. 2 pages. Note; this is an original article separated from the volume, not a reprint or copy. Size: Octavo (standard book size). Quantity Available: 1. Category: Intellectual Observer; Inventory No: 227326. Intellectual Observer, London, 1863. First Edition, Disbound. Very Good. 2 pages. Note; this is an original article separated from the volume, not a reprint or copy. Quantity Available: 1. Category: Intellectual Observer; Inventory No: 237399. The Antiquity of Man. A rare original article from the Intellectual Observer, 1863. Intellectual Observer, London, 1863. First Edition, Disbound. Very Good. 8 pages. Note; this is an original article separated from the volume, not a reprint or copy. Quantity Available: 1. Category: Intellectual Observer; Inventory No: 237383. Arithmetical Recreations. A rare original article from the Intellectual Observer, 1863. Intellectual Observer, London, 1863. First Edition, Disbound. Very Good. 2 pages. Note; this is an original article separated from the volume, not a reprint or copy. Size: Octavo (standard book size). Quantity Available: 1. Category: Intellectual Observer; Inventory No: 227412. Intellectual Observer, London, 1863. First Edition, Disbound. Very Good. 2 pages. Note; this is an original article separated from the volume, not a reprint or copy. Quantity Available: 1. Category: Intellectual Observer; Inventory No: 237482. Artificial Halos. A rare original article from the Intellectual Observer, 1863. Intellectual Observer, London, 1863. First Edition, Disbound. Very Good. 1 page. Note; this is an original article separated from the volume, not a reprint or copy. Size: Octavo (standard book size). Multiple copies available this title. Quantity Available: 2. Category: Intellectual Observer; Inventory No: 227226. Attempts to Foretell The Weather. A rare original article from the Intellectual Observer, 1864. Australian Naturalists. A rare original article from the Intellectual Observer, 1862. Intellectual Observer, London, 1862. First Edition, Disbound. Very Good. 2 pages, some foxing. Note; this is an original article separated from the volume, not a reprint or copy. Size: Octavo (standard book size). Quantity Available: 1. Category: Intellectual Observer; Inventory No: 227216. Intellectual Observer, London, 1862. First Edition, Disbound. Very Good. 2 pages, some foxing. Note; this is an original article separated from the volume, not a reprint or copy. Quantity Available: 1. Category: Intellectual Observer; Inventory No: 237293. Balbiani on The Reproduction of Infusoria. A rare original article from the Intellectual Observer, 1862. Intellectual Observer, London, 1862. First Edition, Disbound. Very Good. 7 pages, some foxing, 4 figures. Note; this is an original article separated from the volume, not a reprint or copy. Size: Octavo (standard book size). Quantity Available: 1. Category: Intellectual Observer; Inventory No: 227215. Intellectual Observer, London, 1862. First Edition, Disbound. Very Good. 7 pages, some foxing, 4 figures. Note; this is an original article separated from the volume, not a reprint or copy. Quantity Available: 1. Category: Intellectual Observer; Inventory No: 237292. Barrow Digging in Yorkshire and Scotland - Discoveries in The Anglo-Saxon Cemetery at Sarr. A rare original article from the Intellectual Observer, 1864. Intellectual Observer, London, 1864. First Edition, Disbound. Very Good. 3 pages. Note; this is an original article separated from the volume, not a reprint or copy. Size: Octavo (standard book size). Quantity Available: 1. Category: Intellectual Observer; Inventory No: 227539. The Barrows in Cumberland. A rare original article from the Intellectual Observer, 1866. Intellectual Observer, London, 1866. First Edition, Disbound. Very Good. 3 pages. Note; this is an original article separated from the volume, not a reprint or copy. Size: Octavo (standard book size). Quantity Available: 1. Category: Intellectual Observer; Inventory No: 227681. Browning's New Aneroid Barometer. A rare original article from the Intellectual Observer, 1864. Intellectual Observer, London, 1864. First Edition, Disbound. Very Good. 5 pages, 1 illustration, some foxing. Note; this is an original article separated from the volume, not a reprint or copy. Size: Octavo (standard book size). Quantity Available: 1. Category: Intellectual Observer; Inventory No: 227502. Intellectual Observer, London, 1863. First Edition, Disbound. Very Good. 5 pages. Note; this is an original article separated from the volume, not a reprint or copy. Size: Octavo (standard book size). Quantity Available: 1. Category: Intellectual Observer; Microscopy. Inventory No: 227271. Carpenter on The Microscope. A rare original article from the Intellectual Observer, 1863. Intellectual Observer, London, 1863. First Edition, Disbound. Very Good. 5 pages. Note; this is an original article separated from the volume, not a reprint or copy. Quantity Available: 1. Category: Intellectual Observer; Microscopy. Inventory No: 237346. The Conditions of Infusorial Life. A rare original article from the Intellectual Observer, 1862. Intellectual Observer, London, 1862. First Edition, Disbound. Very Good. 14 pages. Note; this is an original article separated from the volume, not a reprint or copy. Size: Octavo (standard book size). Quantity Available: 1. Category: Intellectual Observer; Inventory No: 227165. Intellectual Observer, London, 1862. First Edition, Disbound. Very Good. 14 pages. Note; this is an original article separated from the volume, not a reprint or copy. Quantity Available: 1. Category: Intellectual Observer; Inventory No: 237242.